Indesit Company (/ˈɪndɪsɪt/; Italian pronunciation: [ˈindezit]) is an Italian company based in Fabriano, Ancona province. It is one of the leading European manufacturers and distributors of major domestic appliances (washing machines, dryers, dishwashers, fridges, freezers, cookers, hoods, ovens and hobs). It claims to be the undisputed leader in major markets such as Italy, the UK and Russia. Founded in 1975 and listed on the Milan stock exchange since 1987, the Group posted sales of €2.7 billion in 2013. It has eight industrial areas (in Italy, Poland, the UK, Russia and Turkey) and 16,000 employees. The Group’s main brands are Indesit, Hotpoint and Scholtès. Founded in 1975 as Merloni Elettrodomestici SpA by Vittorio Merloni, as a spin-off from Industrie Merloni. Merloni Elettrodomestici bought Indesit in 1987. It was renamed Indesit Company S.p.A in 2005 after the company it acquired. In the 1980s, with other Italian companies having been taken over by foreign appliance manufacturers, Merloni Household became the premier domestic producer in the industry. From 1981 the company went through a period of crisis, which ended in 1984, when Vittorio Merloni, having concluded his presidency of Confindustria, returned to managing Indesit. Profits and revenues of the company grew, and this led the Merloni family to decide in 1986 in favor of the company's entry into the stock market. In 1988, Merloni, under the Ariston and Indesit brands, had a turnover of 1.059 billion dollars, becoming the fourth largest European manufacturer of home appliances. The following year, it acquired and absorbed the French company Scholtès. In 1994, Merloni had a turnover of 1,920 billion lire with a market share of 10% in Europe. The following year took over one third of the capital of Star S.p.A. (Società Trevigiana Apparecchi Riscaldamento), an Italian company of Conegliano Veneto producer of kitchen hoods, which will be fully acquired in 2002 and merged with the Company in 2003. In 1999, through Fineldo, the holding of Merloni family, acquired Panini, manufacturer of collectible stickers. In 2000, Indesit took over the entire capital of Philco and acquired Stinol, the first Russian producer of household appliances. The Company of Fabriano in 2002 entered the consumer electronics industry with the purchase of Sinudyne. 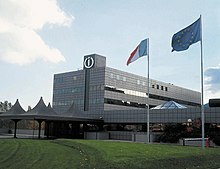 In 2005, Indesit Company closes its French industrial site in Thionville. In February 2005, Merloni Elettrodomestici was renamed Indesit Company: Indesit is the best known of the Group’s brands outside Italy. At the beginning of 2007, Indesit Company launched the Group’s new brand architecture: Hotpoint brand is combined with Ariston to form the Hotpoint-Ariston brand. In 2012 Indesit Company announced its entry into the Small Domestic Appliances market. In 2013, with reference to the year 2012, the maximum A+ application level was reached in the Sustainability Report. In May 2013 Marco Milani was appointed Chairman of the group, maintaining simultaneously the role of CEO. Indesit posted sales of €2.9 billion in 2012. Indesit Company has eight production sites, of which three are in Italy (Fabriano, Comunanza and Caserta), and five are abroad (two in Poland, one in the UK, one in Russia and one in Turkey) counting 16 thousand employees. ^ Wells, John C. (2009). "Indesit". Longman Pronunciation Dictionary. London: Pearson Longman. ISBN 978-1-4058-8118-0. ^ a b c "Company" (in Italian). Indesit Company. 2015-05-20. Retrieved 2015-07-15. ^ "List of Public Companies Worldwide, Letter - Businessweek - Businessweek". Investing.businessweek.com. Retrieved 2015-07-15. ^ "IND.MI Profile | INDESIT COMPANY Stock - Yahoo! Finance". Finance.yahoo.com. Retrieved 2015-07-15. ^ "La fin de la bonne cuisinière Scholtès". L'Humanité (in French). 2005-07-25. Retrieved 2017-06-13. ^ "UK | Wales | 305 jobs to go at Indesit factory". BBC News. 2009-03-03. Retrieved 2015-07-15. ^ "Waterlogic PLC WTL Signed supply agreement with Indesit Company". Bloomberg. Retrieved 2015-07-15. ^ "UPDATE 3-Whirlpool to buy 60 percent of Italy's Indesit for $1 bln". Reuters. 2014-07-11. Retrieved 2015-07-15. ^ Holden, Michael (23 June 2017). "Deadly London tower blaze began in Hotpoint fridge freezer, police say". Reuters. Retrieved 23 June 2017. This page was last edited on 23 October 2018, at 22:38 (UTC).